Our rustic bath house and outdoor shower. All camping and lodging stays require that all people staying with us sign a liability waiver and abide by our camping and lodging rules. Cabin, RV or trailer stays also require a security deposit and an acceptance of financial responsibility as outlined in our reservation policies listed on the reservations page on this web site. If you wish, you may preview these forms by downloading the pdfs below. A copy of our liability waiver is available by downloading this pdf or in person at the outpost. A list of camping and lodging rules are available by downloading this pdf, or in person at the outpost. A copy of the "Acceptance of financial responsibility" form is available by downloading this pdf, or in person at the outpost. The campsite map you see above is our normal site arrangement. Campsite arrangements and features may vary for special events. Please see the special event page for individual event arrangements. For a more detailed look at our sites, view the map in a larger pdf. Site 1, 10, 2, 20: RV or tent site(s). Each of the four sections is 37' long x 21' wide. Two sections equal 1 site depending on your needs. For example: Sections 1A & 2A together would provide a pull thru site 74' long x 21' wide for large RV's or towables who do not wish to disconnect. Sections 1A & 1B together would provide a wider site of 37' long by 42' wide for those wishing a wider site for multiple slide outs or large awnings etc. Site 3: Tent or small RV site. 60' long x 23' wide with some tree obstruction. 20 or 30 amp electric. Site 4: Tent or small RV. 60' long x 26' wide with some tree obstruction. 20 or 30 amp electric. Site 5: Tent or small RV site. 40' long x 32' wide pie shape with some tree obstruction. 20 or 30 amp electric. 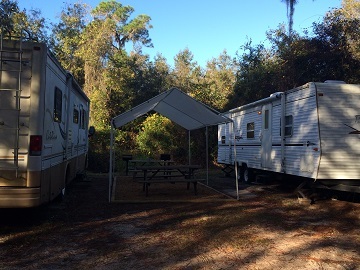 Site 6: RV or tent. 45'long x 21' wide. 20 or 30 amp electric. Very open sites for larger RV's. Site 7: RV or tent. 45'long x 21' wide. 20 or 30 amp electric. Very open sites for larger RV's. Site 70: Tent site. 22' long x 20' wide. 20 amp electric. Site 8: Tent site or small RV. 30' long x 25' wide. 20 amp electric. Site 9: Tent or small RV. 23' long x 19' wide. 30 or 20 amp electric. Site 11: Tent or small RV. 22' long x 20' wide. 20 or 30 amp electric. Tight maneuvering. Site 12: Tent or small RV. 19' long x 18' wide. 20 or 30 amp electric. Tight maneuvering. Site 61: Tent or RV. 25' long x 23' wide. 20 or 30 amp electric. Site 62: Tent or RV. 25' long x 21' wide. 20 or 30 amp electric. Site 63 : Tent or small RV (class A,B or C ) 22' long x 20' wide. 20 or 30 amp electric. Tight maneuvering. Site 64: Tent site. 18' long by 16' wide. 20 amp electric. Tight maneuvering. Site 65: Tent or small RV (class A,B or C ) 22' long x 20' wide. 20 or 30 amp electric. Tight maneuvering. Site 66: Tent or small RV (class A,B or C ) 22' long x 20' wide. 20 or 30 amp electric. Tight maneuvering. Site 67: Tent or RV. 30' long x 21' wide. 20 or 30 amp electric. Tight maneuvering. Site 68: Tent or small RV. Pie shape. 25' long x 35' wide. 20 or 30 amp electric. Tight maneuvering. Looking for a unique venue for a family reunion, wedding, church outing, party or band event? The Canoe Outpost offers a variety of lodging and meeting options that can make your event a fun one to remember. We offer a variety of accessories and services to enhance your event and add to your convenience. Catering services, sound, video and lighting rentals, large gas grills, griddles, charcoal smoker grills and canopy tents too. We would love to accommodate your special event so just call. The Canoe Outpost offers several different options for those wanting to really get away for a while. Whether staying in one of our cabins, tent or RV camping at the outpost or doing a canoe camping trip with primitive camping along the rivers edge, we hope you will enjoy staying with us. For more information on the location and layout of our campsites and rental options, see the map at the bottom of the page. We offer a store for basic drink & snack needs, ice and firewood. Limited free Wi-Fi is available at the store/office. Feel the need to really get back to nature? Well, pack all your gear in your boat, listen for that distant banjo music and head out for a multi-day river camping trip. Click here to be delivered to our river camping page. Rates: Rates are for double occupancy ( 2 persons ). Extra persons are $5 per person per night. Pets are $5 per night per pet. $109.00 per night. $550.00 per week. $1650.00 per month. 2 night minimum for weekends (Friday and Saturday) 1 night stays allowed Sunday - Thursday with a $20.00 rate add on. Make your stay into a real getaway with our $249 special! You get 3 days and 2 nights in our 1 bedroom cabin, and 1 canoe, kayak, or double kayak rental on trip 1 to enjoy our river! 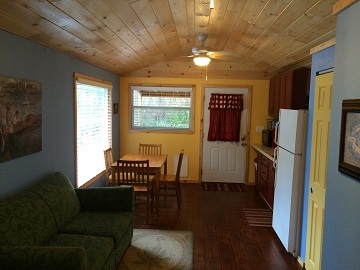 The woods 2 bedroom cabin offers comfortable and spacious accommodations for up to 8 people. Rates: Rates are for quadruple occupancy ( 4 persons ). Extra persons are $5 per person per night. Pets are $5 per night per pet. $149.00 per night. $750.00 per week. $2250.00 per month. Make your stay into a real getaway with our $329 special! You get 3 days and 2 nights in our 2 bedroom cabin, and 1 canoe, kayak, or double kayak rental on trip 1 to enjoy our river! Make your stay into a real getaway with our $249 special! 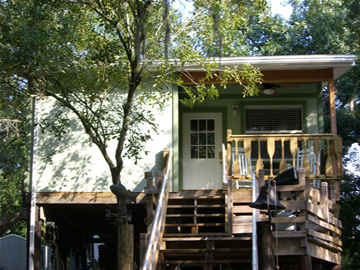 You get 3 days and 2 nights in our studio cabin, and 1 canoe, kayak, or double kayak rental on trip 1 to enjoy our river! We also offer a 32’ RV and a 28’ travel trailer for rent. Each has A/C & heat, hot water, refrigerator, stove, microwave, private bath, TV w/HD air antennae for local channels, a DVD video player, and a stereo. Full linens and kitchen cookware & utensils are provided. The outdoor area for each unit includes a canopy, charcoal grill, a picnic table and a fire ring with flip over grill. The 32’ RV offers a queen bedroom, a convertible double sofa or dinette to sleep a maximum of 4 people. The 28’ trailer offers a queen bedroom and 4 single bunk beds to sleep a maximum of 6 people. Both units have a full bath available for your very limited use. Since full hook-ups are not provided for the RVs and holding tanks are limited, we ask that RV guests use our larger, more comfortable and close by bath house facilities whenever possible. Rate: $70 per night. These are older units but if you are looking for beds, air conditioning and cooking facilities, they do offer a good value. 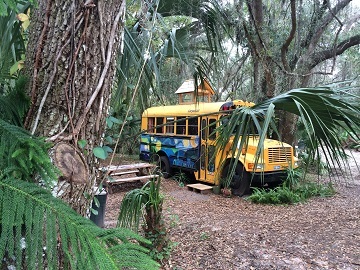 This converted school bus serves as a canvas for art and a fun little place to stay for 2 people. Quirky decoration and custom woodwork offer a unique experience at the Canoe Outpost. Rate: $70 per night. Double occupancy only (exceptions made for small children sleeping in the same bed). The group camping area is an open area surrounded by woods and with a canopy of oak trees overhead. It can accommodate groups up to 50 for camping or more for non-camping events. It may also be rented as individual sites when not rented to groups. It offers a 30' x 30' covered pavilion with lighting and ample electric, cooking and picnic tables and charcoal grills. There is also a covered 16'x24' stage suitable for concerts, presentations or events.The area has cafe style LED lighting around the perimeter of the pavilion and the camp area for event or area lighting, a camper controlled sodium area light, and a big central fire pit with bench seating surrounding it. Tents may be pitched in several alcoves carved into the woods or in the more open area. Several picnic tables may be arranged to fit your needs. Electricity may be accessed at the pavilion or at 3 locations throughout the camp area so be sure to bring extension cords if you want power at your tent. Water is located at the pavilion and at the rear of the camp. 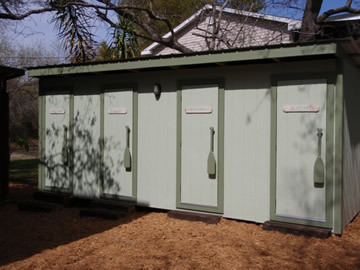 Bath house facilities with flush toilets and 2 indoor and 1 outdoor private hot showers are close by. The group camp area is for tent camping only. No vehicles are allowed in the group camp area without special arrangement. Gear drop off is allowed about 20' from the pavilion and ample parking is located about 100' away from the group camp area. 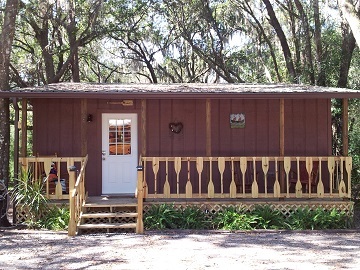 Rates: The entire camp area may be rented for exclusive use of your family, event or group for $119 per night. When not rented for exclusive use, individual tent sites may be rented in the group area for $24 per tent site with shared access to the pavilion. Group Camp Area Reservation Policy: Preference is given to exclusive use reservations for the entire camp area. Individual site reservations for the group camp area are accepted but are always subject to reassignment to another individual site area if we receive an exclusive use group reservation. If this occurs, you would be contacted and offered an exclusive use reservation first. There is a 2 night minimum for the group camp area for weekends (Friday & Saturday) except for special arrangements. Individual sites are available for tent or RV camping. Each site comes with water and electricity (20 amp duplex outlet and/or 30 amp RV plug in), a picnic table, a post style charcoal grill and a fire ring with a flip over cooking grate. 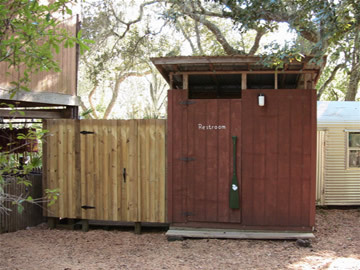 Bath house facilities with flush toilets and 2 indoor and 1 outdoor private hot showers are close by. A dump station is available. We allow 1 tent or RV per site with a maximum of 6 people (Exception: Families may have a second small tent, a “kids tent”, on one site.) Parking is on site with additional parking close by. Please see our site map and descriptions to help select your site. Rates: $24 for tent and $28 for RV, trailer or camper vehicle per site. $144 a week for tent, $168 a week for RV. $432 a month for tent, $504 a month for RV. Rates and site configurations may vary during special events. Group Semi-Primitive Area: This wooded area is suitable for 5 tents, depending on size. It may be reserved as an exclusive use area for $96.00 or for individual tents at $24.00 per night. It offers 5 picnic tables and 5 fire rings, 2 shared post charcoal grills, and a water tap. There is one electrical outlet with limited power that is intended for limited use for lighting or device charging. It will not run multiple appliances and no heaters or air conditioners are permitted. Only during times of high demand, such as our music festivals, we offer open primitive camping here on property for $12 a night. Open primitive camping comes with no accessories. Reservations are required but spots are assigned on a first come first serve basis. It is basically a spot of ground to pitch a tent and access to our bathhouse. We have also partnered with the Masonic park across the street to offer overflow primitive camping for the same price. Please see specific event details for more information. 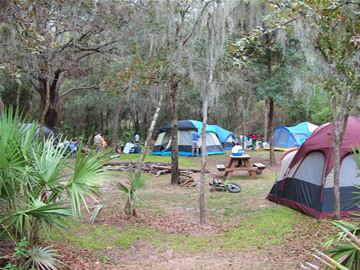 Reservable Primitive Tent Camping: We have individual primitive and group semi-primitive primitive tent sites available. These sites are located approximately 300' back in the woods and are not accessible by vehicle. 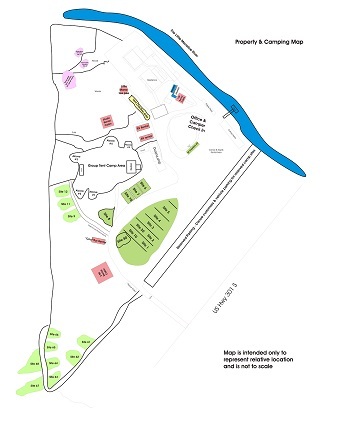 (Please see the camping map pdf) Pull carts are available to aid in transporting your gear to your site.. Restrooms and showers are located less than 2 minutes walk away. Individual Primitive Sites: They offer a picnic table, fire ring w/flip over grate, post style charcoal grill. Sites are $20.00 per night. While our camping and lodging selection offers a number of great options, if you're in the mood for the more tradtitional hotel experience the Canoe Outpost recommends the Hampton Inn Ellenton-Bradenton for your convenience.